"Hey Allentown!" That's what I hear frequently while on my bike in the Elmwood Village. That's what Sly (pictured above) knows me as. He used to panhandle in Allentown but as he put it, "I'm not allowed in Allentown anymore." But that's an entire neighborhood, I'd think to myself. He does have a rather gruff appearance (and that's putting it mildly). Some are afraid of him, some--with closed minds and hearts--get angry with him. Once I saw a couple collage boys threaten him physically when he asked them for money. This, I've heard is also the reason he's "not allowed" in Allentown any longer. I was told he was beat up by someone there a couple years ago and told it will happen again if he returns. But nonetheless, he is a fellow human on this rock we call earth, and at times--when he is lucid--a very friendly and coherent one at that. Such was the other night when I ran into him while exiting a bar on Elmwood. I was walking to my bike when I hear his familiar beckon, "Hey Allentown," and I turn to see him with his distinctive hobble coming over to me. I gave him a couple bucks and asked how he was doing. "Oh you know you know." Where you staying I asked. "Right here, man, right here on the street." How about winter, like last winter, I questioned. "Oh you know, hospitals, churches, and other places." He has a mental disability, and I've heard he spends winter nights at the psychiatric hospital, but I don't know if that is true. I've also heard that he is a Vietnam vet and had an emotional break during the war. I don't know if that is true either. But what I do know is that he is a nice guy and interesting to talk to at times. And it's interesting, I am finding out that when I ask people if I can take their photo most people say yes right away. This was the case with Sly the other night. He commented on my bike, "Hey man, that's a nice bike, you didn't tell me you got a new bike." Would you stand in front of it while I take your picture, I asked him. 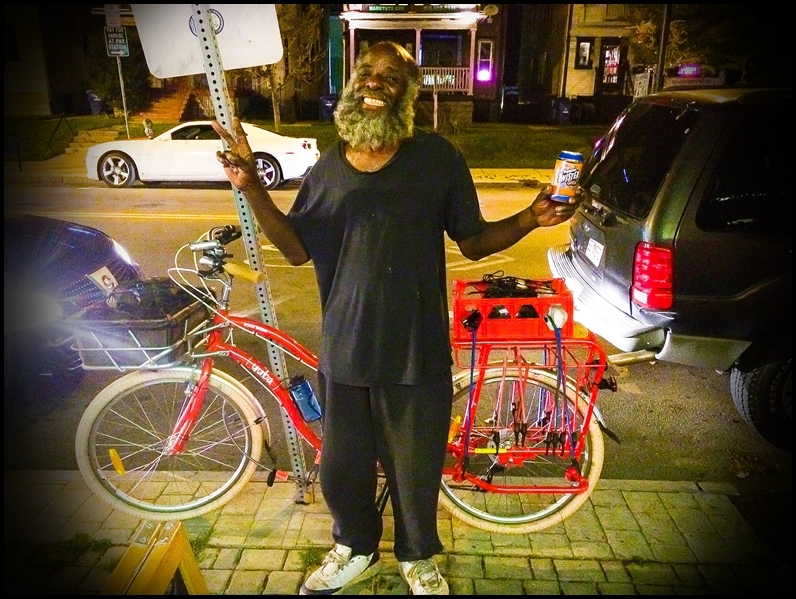 He immediately stood in front the bike, flashed a grin from ear-to-ear and held out the peace sign with his right hand (and, FYI, for those who may make the sweeping rash judgment of street people, that's a soda in his left hand, not a beer). Personally, I feel the world needs more Slys and less "Donalds" (sorry, there's my judgment). When we shook hands I noticed, as I have in the past, how calloused his hand was; likely from the hard life of living on the street. And as I pedaled away on a really lovely summer night I saw him make a b-line towards a group young college girls and could hear his familiar mumble, "Hey can you help me out with a little something, I'm trying to get something to eat." When they turned him down, or more specifically ignored him and kept a large distance from him as they passed, he moved onto the next group of people coming down the street. Thankfully I do not know this personally, and contrary to what a lot of people think about the homeless (another judgment, sorry), is that one can not be lazy or stupid to survive on the street. As the summer ends and the cold months loom closer each day, I pray that Sly makes it through, because he makes this world just a little bit more interesting. And that's what I was thinking about as I pedaled and coasted home on a warm summer's night with a few beers in my belly.